"Corral" redirects here. For other uses, see Corral (disambiguation). For other uses, see Pen (disambiguation). A pen is an enclosure for holding animals such as livestock or pets that are unwanted inside the house. The term describes types of enclosures that may confine one or many animals. Construction and terminology vary depending on the region of the world, purpose, animal species to be confined, local materials used and tradition. Pen or penning as a verb refers to the act of confining animals in an enclosure. In Australia and New Zealand a pen is a small enclosure for livestock (especially sheep or cattle), which is part of a larger construction, e.g. calf pen, forcing pen (or yard) in sheep or cattle yards, or a sweating pen or catching pen in a shearing shed. In Australia, a paddock may encompass a large, fenced grazing area of many acres, not to be confused with the American English use of paddock as interchangeable with corral or pen, describing smaller, confined areas. In British English, a sheep pen is also called a folding, sheepfold or sheepcote. Modern shepherds more commonly use terms such as closing or confinement pen for small sheep pens. Most structures today referred to as sheepfolds are ancient dry stone semicircles. In the United States, the term pen usually describes outdoor small enclosures for holding animals. These may be for encasing livestock or pets that cannot be kept indoors. Pens may be named by their purpose, such as a holding pen, used for short-term confinement. A pen for cattle may also be called a corral, a term borrowed from the Spanish language. Groups of pens that are part of a larger complex may be called a stockyard, where a series of pens holds a large number of animals, or a feedlot, which is type of stockyard used to confine animals that are being fattened. A large pen for horses is called a paddock (Eastern USA) or a corral (Western USA). In some places an exhibition arena may be called a show pen. A small pen for horses (no more than 15–20 feet on any side) is only known as a pen if it lacks any roof or shelter, otherwise it is called a stall and is part of a stable. A large fenced grazing area of many acres is called a pasture, or, in some cases, rangeland. Primitive pens in South Africa are called kraal. 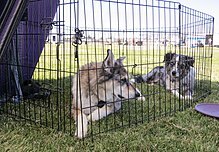 For pets, specialized folding fencing referred to as an exercise pen, x-pen, or ex pen, is used to surround an area, usually outdoors but not always, in which the animals can freely move around. They are commonly used for dogs, such as to give puppies or adult dogs more space than dog crates, but can also be used for rabbits and other animals. Exercise pens are usually made of sturdy wire, but can also be plastic or wood. Horses, during training, are often exercised in a round pen, sometimes referred to as an exercise pen. ^ Klein, Richard (June 1986). "The Prehistory of Stone Age Herders in the Cape Province of South Africa". Prehistoric Pastoralism. South African Archaeological Society. 5: 5–12.